In 2015, more than 70% of the crude oil produced in the Lower 48 states was light oil with an API gravity above 35 degrees. At the same time, 90% of imported crude oil was heavier, with a gravity below 35 degrees API. To accommodate increasing U.S. production of light crude oil, refineries have adjusted their imports by reducing imports of light crudes. The differences between domestic production and imports in this key oil characteristic could bring changes to petroleum refinery operations in the United States, as discussed in the EIA report, Implications of Increasing Light Tight Oil Production for U.S. Refining. Domestic crude oil production has grown rapidly in recent years, primarily because of light crude oil produced from low permeability (tight) formations. EIA's report on crude oil production and crude oil quality estimates that about 90% of the nearly 3.0 million barrel per day (b/d) growth in production from 2011 to 2014 consisted of light crude oil, with an API gravity of 40 or above. At the same time, light crude oil imports fell from 1.7 million b/d in 2011 to 0.7 million b/d in 2014, and medium crude oil (27° ≤ API < 35°) imports decreased from 3.3 million b/d to 2.5 million b/d. Imports of heavy crude oil (<27° API) have remained near 4.0 million b/d since 2010. U.S. refineries reflect a wide range of capacities, quality of crude oil inputs, utilization rates, and sources of crude oil supply. Most U.S. refineries are designed to run medium to heavy crude oil. However, technical options are available for shifts in input streams to process additional light crude oil. For example, refineries optimized to run very heavy crude oil through cokers and other deep conversion units could reduce the use of those units and instead run light crude oil if that is a more profitable option. Depending on the prices of the different crude oils, the processing units that a refinery has, and the value of the resulting refined petroleum products, refineries will choose to process crude oils that optimize profit margins. 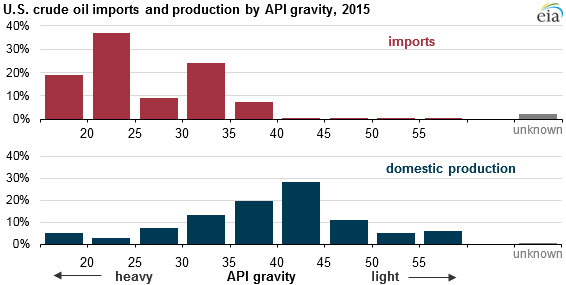 In 2015, the average API gravity for domestic refinery inputs was about 32 degrees, as refiners blended heavy and light crude oils to make a medium-grade feedstock. As discussed in EIA's report, Technical Options for Processing Additional Light Tight Oil Volumes Within the United States, U.S. refineries have accommodated much of the growth in U.S. crude production from 2010 to 2014 with two limited- or no-investment-cost options: displacing imports of crude oil (primarily light crude oil, but also medium crude oil) from countries other than Canada and increasing refinery utilization rates.